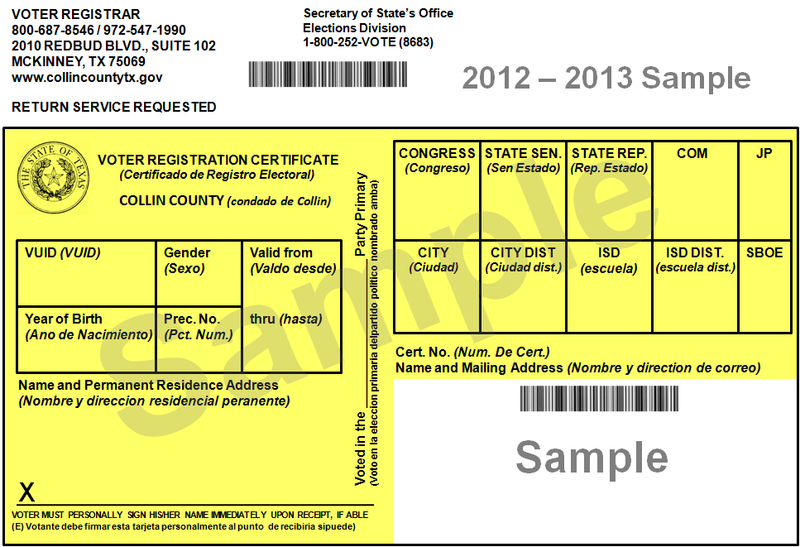 Today, October 9, 2012, is the deadline to be registered to vote in the 2012 Texas General Election. Are you registered to vote? Even if you think you are registered you should double check your registration status RIGHT NOW, because your registration could have been suspended or completely purged. 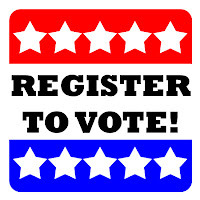 To vote early, starting Monday, October 22, 2012, or on Election Day, November 6th, you must be registered to vote or have mailed your new (or change of address) voter registration form to the election office for the county in which you currently reside so that it is postmarked before 11:59pm, October 9, 2012. I have worked every election as Early Voting and Election Day Election Clerk, and more recently Alternate Judge, for the last ten years. In the last two hours of every November Election Day too many last minute voters, who may have waited in a line for up to an hour, check in to vote only find they are not registered. Waiting until 5:00pm on Election Day, Tuesday, November 6, 2012 to discover a problem with your registration status is too late - if you check your registration status NOW and find a problem, you can fix it. My polling place always calls the county election office to ask them to search their records to determine why a person who thinks they are registered vote is not on the polling place list of registered voters. Sometimes the election office finds that a properly registered voter is not on the polling place list of voters due to a clerical error, in which case the person can vote a regular ballot. More often, would-be voters not found in the polling place list of voters are not properly registered and their only option is to vote a provisional ballot, as provided under the federal Help America to Vote Act. There are several typical reasons would-be voters find they are not registered. Top on the list of reasons is that people think they were automatically registered when they changed, renewed or applied for their Texas driver's license at the Department of Motor Vehicles office - but that DMV voter registration did not occur. As required by the federal National Voter Registration Act of 1993, better known as the ‘Motor Voter’ law, Texas DMV workers are suppose to ask everyone they process if they want to register to vote or to update their registration information. If the client replies yes, state employees ask eligibility questions and enter that information directly into their computers. Software processes the registrant’s information — name, age, address, citizenship, etc. — and automatically prepares a voter registration application with all the registrant’s identifying information. The DMV employee then ask the registrant to review the application for correctness, and sign it using a pen. The voter registration application is then scanned, where the signature is electronically captured as an electronic image file. That image file is then combined with the voter’s other digitized information and electronically sent to election offices where the application is processed. If all the application information is verified, the registrant is added to the voter registration data base in the county where they reside and to the Texas Secretary of State's statewide TEAM voter registration data base. If you haven't voted in the last two federal elections, you may no longer be registered to vote. 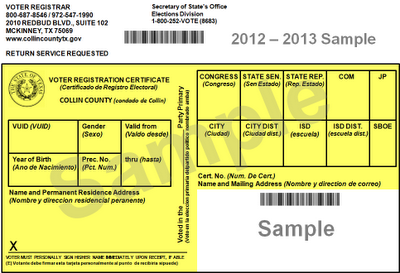 If you did not receive a yellow 2012-13 Voter Registration Card (VRC), you may no longer be registered to vote. 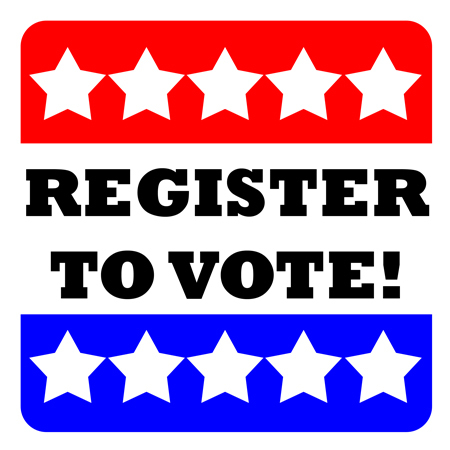 If you moved, but you did not go to your county's election registration office to file a voter registration form for your current residence, you may no longer be registered to vote.